Panthertown Valley Backcountry Area is part of the Nantahala National Forest, located in Jackson County between Lake Toxaway and Cashiers (near US Highway 64). This area is sometimes referred to as the "Yosemite of the East." 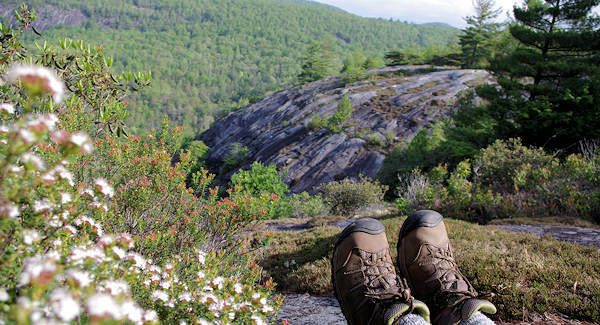 Find granite rock domes with 300-ft. cliffs, deep gorges, broad valleys, bogs, trout streams and many waterfalls. Explore 30 miles of maintained and marked trails where you can hike, bike or ride a horse. Many of the trails follow old logging roads with spectacular overlooks. It's about 55 miles southwest of Asheville (allow 1.5 hours to drive). There are two main entrances: Cold Mountain (East) and Salt Rock (West). 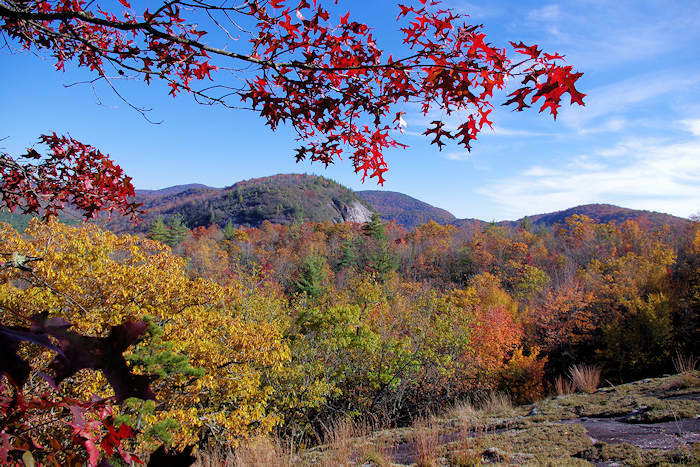 The Panthertown Valley area lies on the eastern continental divide in North Carolina's Blue Ridge Mountains. 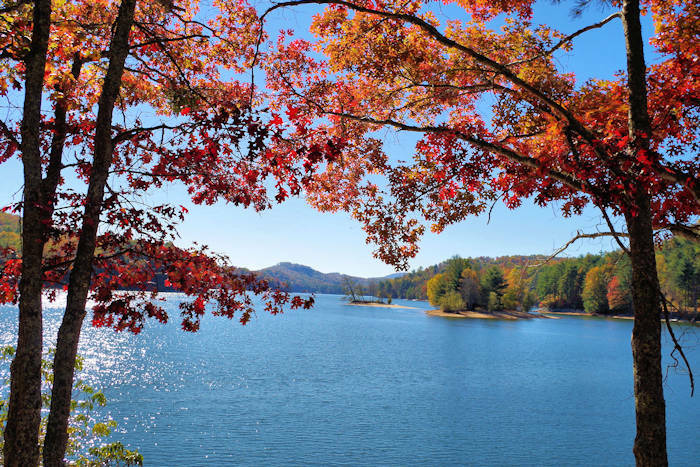 The headwaters of the Tuckaseegee River and the east fork of Little Tennessee River create biologically diverse habitats for wildlife and rare plants. Panthertown is designated as a Blue Ridge National Heritage Area. Camping is permitted with campsites dotted along trails, but groups are limited to no more than 12 people per site. Use bear-proof food canisters since bears sometimes explore campsites at night. No commercial equestrian or mountain bike outfitter/guides are permitted. The wonderful volunteer group, Friends of Panthertown (read about them below), protects and maintains the public trails in Panthertown Valley spread out over 6,300 acres. There are many hiking choices in Panthertown Valley. Schoolhouse Falls is the most popular waterfall in this area. From the Cold Mountain parking area, it's a moderate 2.5-mile roundtrip hike. Or you can take a 5-mile loop hike that includes spectacular mountain views from atop Little Green Mountain and Greenland Creek Falls.IMPORTANT: While trails are marked, you can easily miss the blazes or trail markers if you are not paying attention. There are many side trails - avoid them so you won't get lost. Take a map or print the one for this hike below. 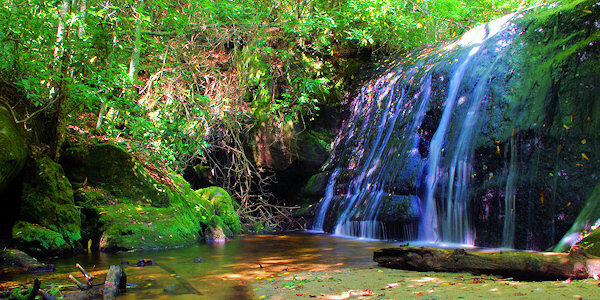 See our hike guide to Schoolhouse Falls for all the details. The Panthertown Valley Trail main trail (3.3 miles) runs through the valley from the Cold Mountain (East) entrance to the Salt Rock (West) entrance. Since there are many intersecting trails, there are many possibilities for a loop hike. It's an easy trail to walk with gentle climbs. Download a hiking map. 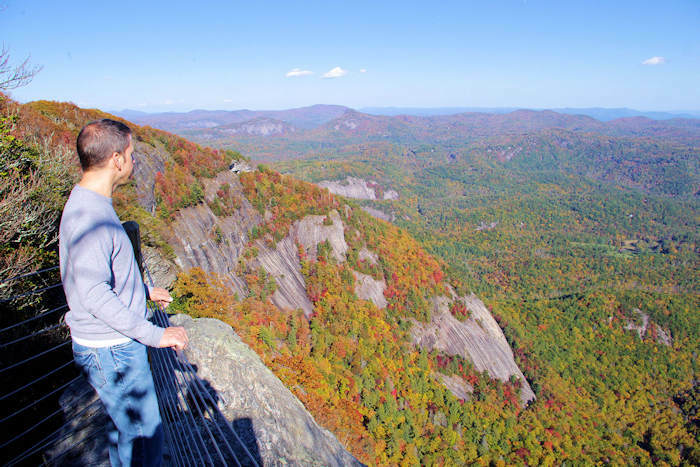 Salt Rock Gap provides excellent views of the entire Panthertown Valley area from its rock face (photo at very top of page), including dome-like faces of Big Green Mountain Summit and Little Green Mountain. It's only about 1/4-mile from the West Entrance parking. From the Overlook Trail, there are spectacular 180-degree views of Big and Little Green Mountains, and the entire Panthertown Valley, from the open summit of Blackrock Mountain. Can be made into a loop with the Blackrock, Panthertown Valley and Powerline Road trails. 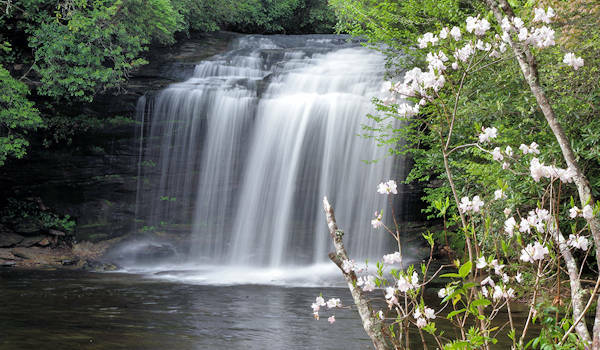 See two waterfalls on this two-mile loop from the West Entrance for Panthertown Valley. Follow Panthertown Valley Trail #474 downhill from the gate. In about 1/4-mile, stop at Salt Rock Gap on the left and venture out on the rock face to see views of the valley. Return to the trail and continue about 1/3-mile to Deep Gap Trail #449 on the right. In another 1/3-mile, the Great Wall Trail #489 forks to the left. Keep to your RIGHT on Deep Gap Trail for 1/10-mile to Frolictown Falls. At the falls, Wilderness Falls Trail goes to the right. At that intersection, a side trail to the left takes you to the base of Frolictown Falls nestled in a beautiful setting. From Frolictown Falls, climb back to the main trail and head straight across on Wilderness Falls Trail. About 1/3-mile up that trail, you'll see Wilderness Falls to the left. There are several side trails that take you to the falls for a closer view. Be careful since this side trails can be slippery! 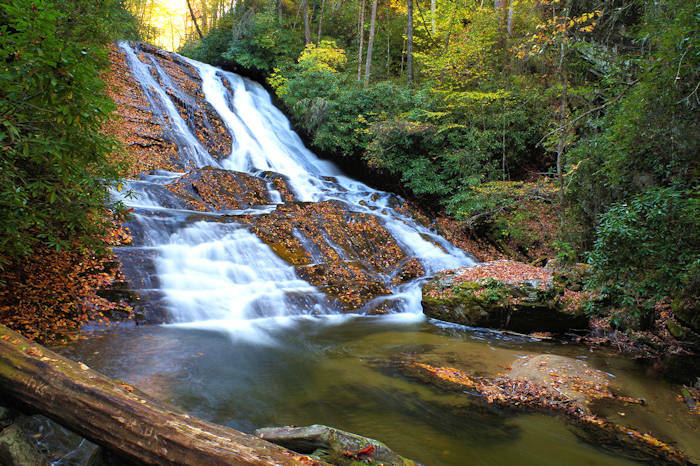 Continue up the steep trail by the falls and hike mostly uphill back to Panthertown Valley Trail (about 1/2-mile past Wilderness Falls). This is a narrow trail that is difficult to follow at times - watch for occasionally green blazes, mostly uphill. Turn left on Panthertown Valley Trail to return to your car. Save JPEG of the full map to your phone. 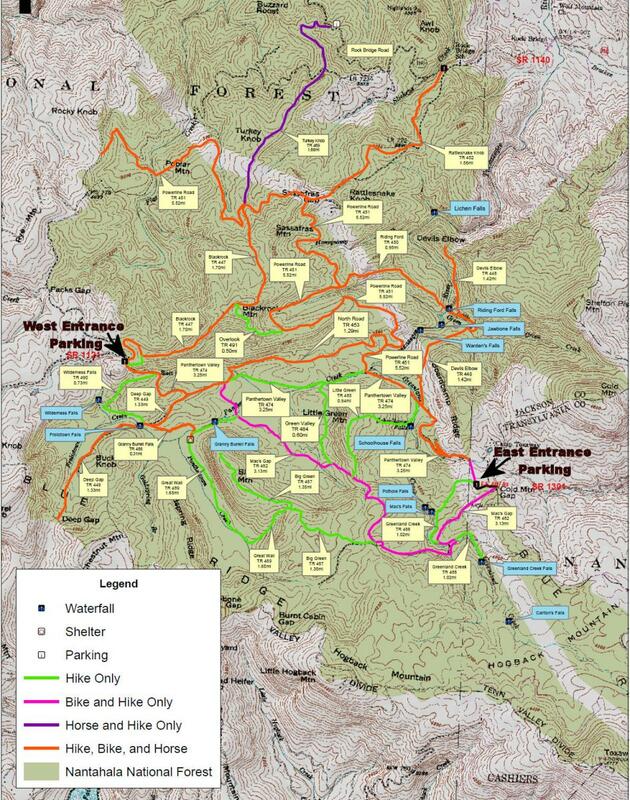 Download a PDF of trails map. Panthertown is here for us to enjoy and preserve thanks to the NC Chapter of the Nature Conservancy, who purchased 6,295 acres of the valley from Duke Power in 1989. From the main intersection of US Highway 64 and NC Highway 107 in Cashiers. take US 64 East (towards Brevard) for 2 miles to "Cedar Creek Road" on your left (crossing the Horsepasture River). Take Cedar Creek Road for 2.3 miles to Breedlove Road on your right. Travel 3.3 miles to the end of the pavement for Breedlove Rd. Either park at the cul-de-sac or continue on the short gravel/mud road to the main parking area. There are no facilities, ranger offices or visitor centers at Panthertown. 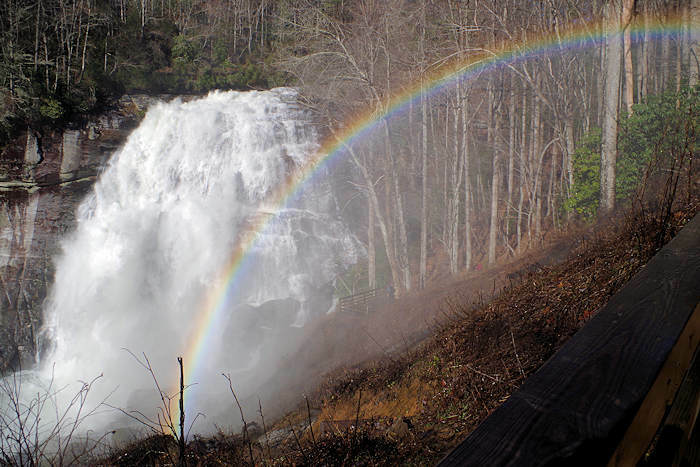 For questions, contact the Nantahala Ranger District in Franklin at 828-524-6441. This hard-working volunteer group provides and raises funds for conservation projects in Panthertown Valley. 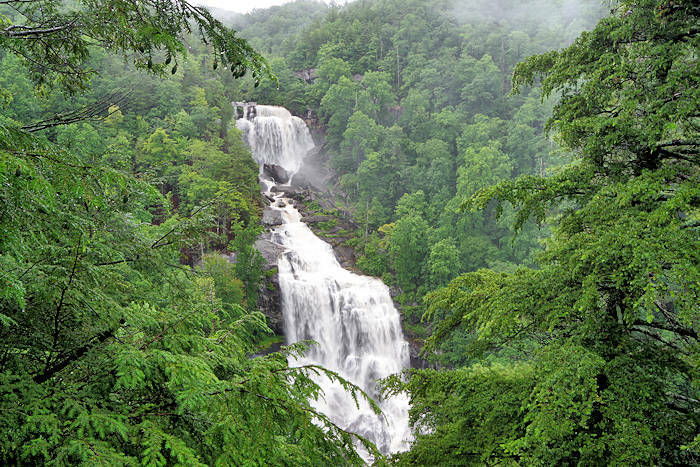 They work in partnership with the U.S. Forest Service to conserve this outstanding natural resource while improving the quality and experience of recreational opportunities in Panthertown Valley. They have monthly work days, foster environmental stewardship through outreach and education, restore and maintain 30 miles of public non-motorized trails, construct trail-head facilities, repair bridges and existing structures, protect natural resources and monitor fragile ecosystems. Go to their website.